I absolutely live for festival season. While I'm not all about the fashion that goes with it, there is nothing more appealing to me than spending a day in a field, singing along to some of your favourite tunes, and that's exactly what I did on Saturday 8th July! 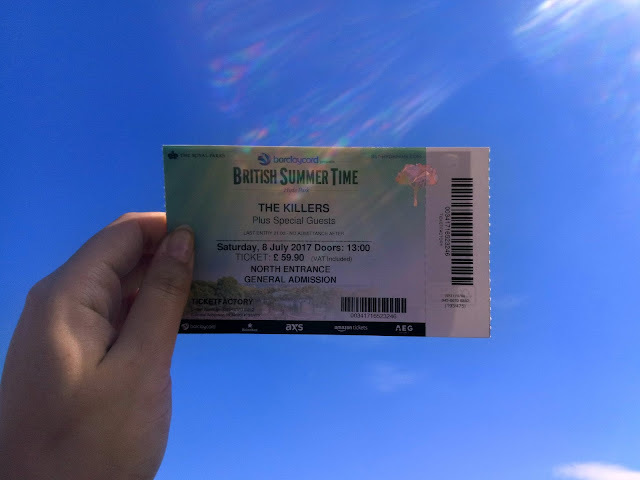 Way back in January, I saw that The Killers had been announced as one of the headliners for British Summer Time festival in London, and just knew that I had to go. 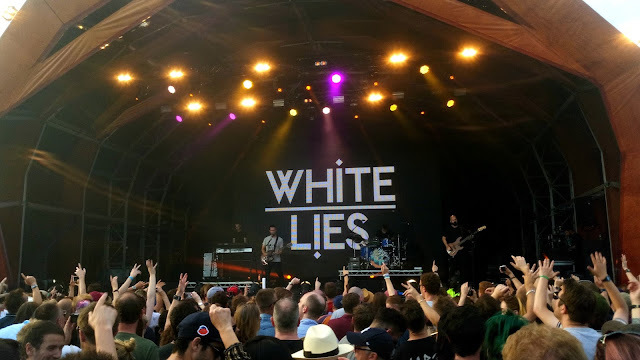 The fact that White Lies was one of the support acts just sealed the deal for me, and next thing I knew, we were booking tickets and trains! What I love about British Summer Time is that it's slightly different to the usual festivals in that it's a week long festival with a select few acts each day. I think the typical thing to do is pick a day that you want to go to and just buy a ticket for that, but there's no camping or anything like that, so going to the whole week isn't the done thing (unless you can afford a hotel, as well as seven lots of tickets, for that long or live nearby). I think this gives it a bit of a unique spin and means that you can go to London for the day or weekend and enjoy yourself! 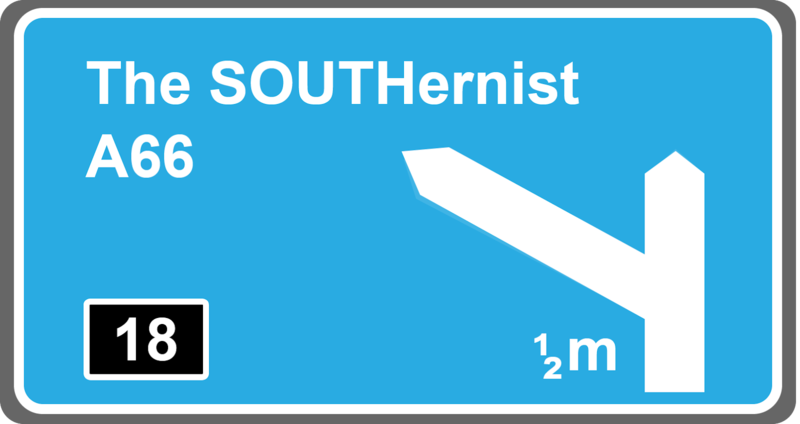 After much debating about how to get down to the South, I decided the train was the way forward. Driving is stressful enough as it is for me, but the thought of driving in London turns my stomach. I managed to find an amazing train and hotel deal on SuperBreak, and while the hotel wasn't exactly the Ritz, it was somewhere to stay for a night. I bought a bunch of things to have for a picnic breakfast on the train, including pastries, juice and yogurt. We love a good train journey in this family, so we just had to go all out! 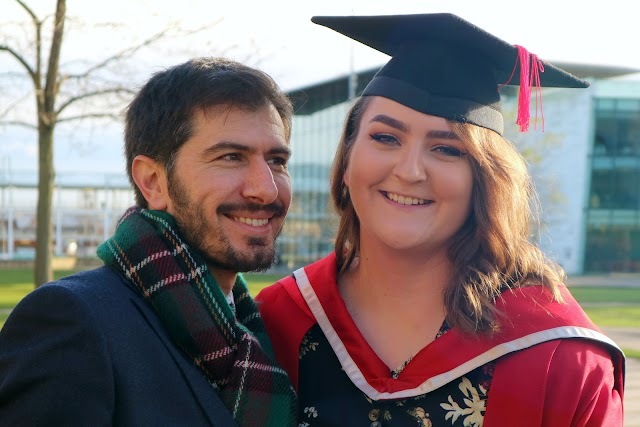 I spent most of my time reading Louise Pentland's book 'Wilde Like Me', whilst my sister applied her makeup and J caught up on one of his favourite programmes. All in all, it was a fab trip down. We arrived in London and were welcomed by sweltering heat. It felt like we were abroad! Luckily, our hotel was only a short walk from Kings Cross, so we headed there to dump our bags and head out into the city. It was Gay Pride that weekend, so everywhere was coloured with rainbows and the whole place was just buzzing with excitement. We caught the tube to Leicester Square to meet up with our aunties and my goddaughter, and there were some rather fabulous drag queens singing in the station. We all met up at a little pub just around the corner from the station to have a bite to eat before heading to Hyde Park, and there was a stage just opposite the pub for a Pride event, so were treated to a bit of music as we ate. Niamh, my goddaughter, absolutely loves to dance and show off, so she was having a good old boogie and pulling in lots of 'awww's. Once we'd all eaten, we hopped back on the tube and made our way to Hyde Park. I was quite pleased that all of our destinations were quite close together because, as I mentioned, London was extremely warm and the tube is a sweat box as it is, so I didn't fancy being on it for too long in that heat. We came out of the Hyde Park Corner station and made our way to the entrance, where our tickets were checked and bags thoroughly searched. I was happy to see that security was being taken so seriously, with all of the recent, horrible things that have been happening in London and the two massive events happening on that day. By this point, Niamh was fast asleep in her pushchair, having a little afternoon nap, totally oblivious to the man searching around her for any hidden items! We got through perfectly fine and entered into the main arena. Claire, Julie and Niamh found a place to camp for the day near the main stage, but I wanted to explore a bit more, so I dragged my sister and J with me. The arena was a huge open space bordered by trees and all around the perimeter, there were bars and food stalls. 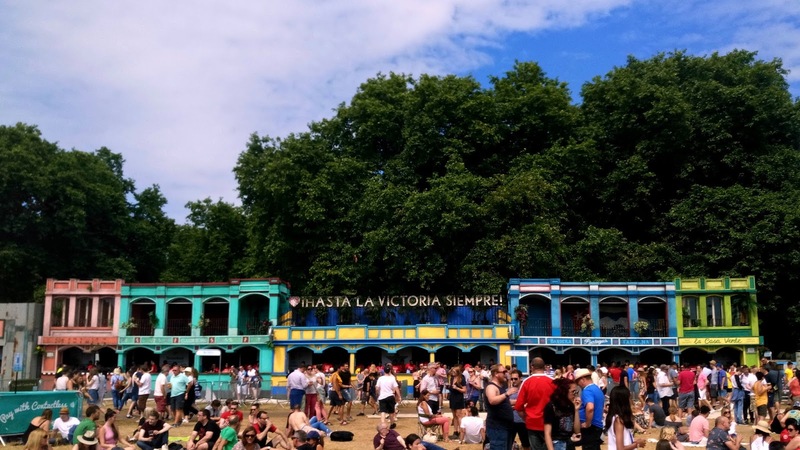 However, each section had it's own sort of 'theme', so that image you see above, that area was supposed to be like a Cuban, Havana-style space, and there was even a little stage there with amazing carnival dancers on. 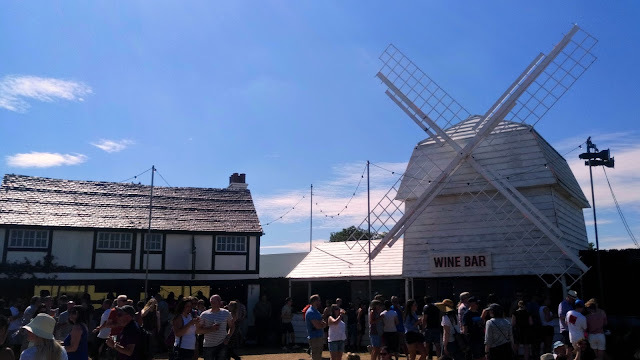 On the opposite side of the arena, though, was an English countryside-esque area, complete with a windmill and country pub! It was such a fab idea to design the edge of the arena like that, as it felt like you were being transported to a different place with each section. There were also tons of other things to get involved with, like a second stage (where White Lies would be playing - eek! 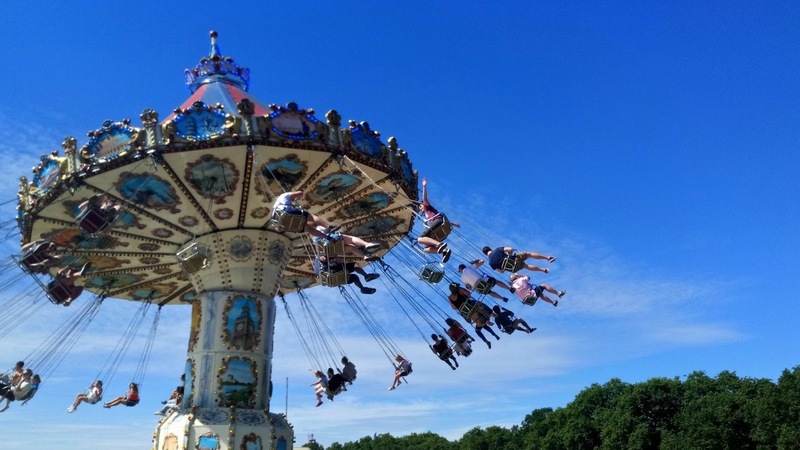 ), games with chances to win freebies, a chairswing and an area for Barclaycard customers with bungee jumps, a ball pit room and a slide. Once we'd walked all around the edge of the arena and got an idea of where everything was, we headed back towards the main stage to meet up with the rest of our troop. We made it back just in time for Tears For Fears, an 80s pop rock band that I'd been quietly very excited to see. We jammed along to Everybody Wants To Rule The World, Shout and Mad World - even Niamh woke up from her nap to join in! They were absolutely fab and of course, everybody knew most of the songs, so the crowd were loving it! Also, can we just take a minute to appreciate the main stage design in the image below? I know it's not the closest picture ever, but I'm living for the trees on either side and there was a whole load of foliage spilling over the roof - it looked just like part of the background. Once their set had finished, we all got comfy again on our little picnic blanket. I think it was probably at this point that I realised that I was starting to burn and slathered a load of the baby's sun cream all over myself. Because the area of Hyde Park that the festival was held in was so open, there was literally no shade, so the sun was beating down on us all day long. Seriously, whenever a cloud moved in front of the sun, the crowd cheered, it was that hot. 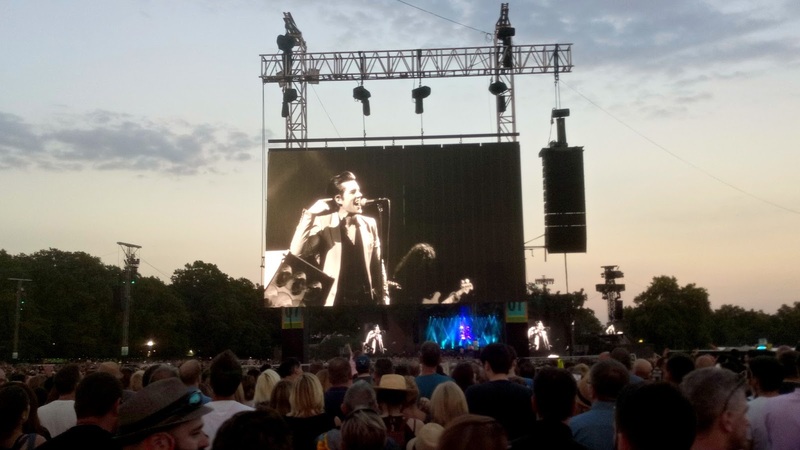 I also had a horrible realisation that J and I would have to leave partway through Elbow's set to go see White Lies and then quickly run back to the main stage for The Killers. I was a bit gutted because I quite like seeing Elbow live, despite not really being a fan, but because my mum loves them, I know practically all of the songs. We got to hear The Birds, The Bones of You, Mirrorball and few others before we left for the Barclaycard stage. We also heard Grounds For Divorce and One Day Like This from afar, but I was so excited to see White Lies that I didn't feel so disappointed about missing them too much. As always, White Lies were incredible. There has never been a time that I've seen them and been disappointed - they're just constantly amazing. It was great to hear some of the songs from the new album, Friends, now that I'm more familiar with them and could sing along. We managed to get quite close to the front, so we were right in the heart of the action and the crowd was absolutely electric. The only thing that ruined it for me was some girl behind us that told J to put his arm down when he was enjoying himself. There's really no excuse to stop someone else from having a good time like that, is there? But anyway, it felt like the set went by so quickly, despite them playing a good amount of songs, but I was so sad when it was over. There was confetti though, and White Lies said on social media that it was one of their favourite festival sets to date, so I can't complain! 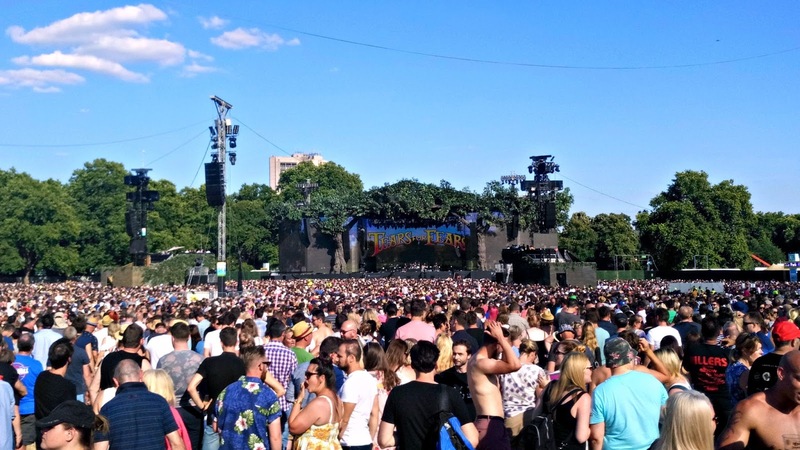 We quickly hopped over to the main stage and managed to get back just before The Killers started. I am pretty much a diehard fan of The Killers. Ever since I heard Hot Fuss, I've been hooked and in my opinion, they just keep going up. They opened their set with The Man, which I originally resented a little bit, but after listening to it a few more times, I just can't get enough. It's so damn catchy! So I thoroughly enjoyed boogieing to that, and then they kicked in with all of the hits. Despite being pretty far away from the stage to protect the baby's ears, we had a screen right in front of us so I could see Brandon Flowers' beautiful face and feel like I'm part of the fun at the front of the stage. It felt so good to know every single one of the songs and put my all into singing along with the words. The atmosphere was insane and everyone was having a brilliant time! It was also great because the sun was setting by this point, so it had cooled down drastically, meaning that I could dance all I wanted without getting too sweaty. They played all the crowd favourites like All These Things That I've Done, Read My Mind and of course, Mr. Brightside right at the end, but there were other less known songs too, like Shot At The Night and Shadowplay. It was a real mixed bag of tunes, but I loved every second and would quite happily lose my voice all over again for it! Their set came to a close and so did our day in Hyde Park. I won't go into detail about our journey back to the hotel, but just know that it was long, painful and very stressful - tube stations crammed full of festival goers are not the one, especially with a pushchair and a sleeping baby. But I absolutely loved the day and it gave me such a hankering to go to more festivals! Ohh they're one of my absolute favourite live bands - that was the fifth time I've seen them! 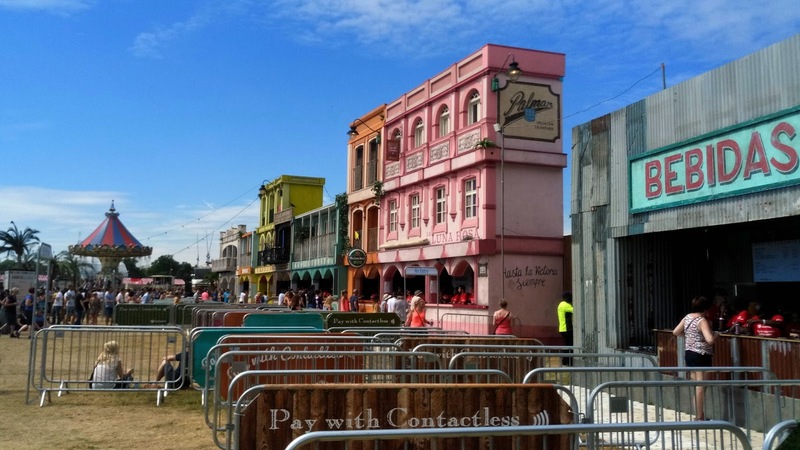 Festivals really are a summer staple, aren't they? Even if you don't get to go to one of the huge ones, even little local festivals can have great vibes. This looks like so much fun! Jealous!